Whenever we ask bass music artists which soft synths they favour, three Native Instruments products are invariably among those mentioned: Massive, Razor, and FM8. Some of you will surely be pleased to learn, then, that until 24 June, each of them is available at half price as part of NI's Bass Invaders promo. Alternatively, you can buy all three synths together and save even more. Full details are below, but the most significant detail is that Massive and FM8 each cost €89.50/$99.60, while Razor can be yours for €34.50/$39.50. 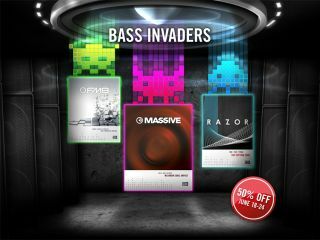 The complete Bass Invaders bundle is available for €179/$199. The sales special is supported by a new video featuring LA's renowned bass music pioneers 12th Planet and Flinch. In the video, they discuss their use of MASSIVE, RAZOR and other NI instruments, and talk about their own experience in the dubstep and bass music scene. MASSIVE and RAZOR users can download a selection of presets from both artists for free from the campaign landing page. The BASS INVADERS special is also featured on the KOMPLETE Facebook page, with further preset sounds and tutorial videos. 'Bass music' has become a catch all term for numerous contemporary electronic musical styles, unified by a central force - bass. Encompassing genres such as drum and bass, dubstep, techno, garage, grime, funky and beyond, bass music has exploded in popularity over the past few years, and has broken out of the underground to embrace a vast new audience. NI has been at the forefront of the bass music continuum thanks to the innovative sound designers and cutting edge musicians who have developed the essential go-to tools of the trade. When bought in the NI Online Shop before June 24th 2012, MASSIVE and FM8 both cost $99.50 / 89.50 EUR, while RAZOR is available for $39.50 / 34.50 EUR. All three products can be bought as a bundle for $199 / 179 EUR during the offer period.